It seems appropriate that a game called Starcraft: Ghost is apparently neither living nor dead. Before we launch into things, I want you each to locate a salt lick no less than two inches wide by two inches deep. A proper moose-grade lick. Anything less and you might be tempted to blow what I'm about to tell you way, way out of proportion - like the rest of the internet. Alright, got your lick? Well, go on. Lick it. I'll wait. Done? Good, because according to Diablo 3 designer Matthew Burger Starcraft: Ghost may still hit store shelves. This news comes to us from the UK incarnation of Official PlayStation Magazine. Burger was initially approached to discuss the upcoming PlayStation 3 iteration of Diablo 3, but when the chat turned toward the long-lost Starcraft: Ghost, Burger seemingly hinted that it might not be so lost after all. "[Starcraft: Ghost is] on hold. It has never been cancelled," Burger states. When inevitably asked if that means that we might still one day play the game, Burger replies simply, "Maybe." That's not much to go on, but it's important to keep in mind that this is a Blizzard Entertainment game we're talking about here - and not just that, it's a spin-off of what is arguably the planet's most popular strategy franchise, which would adapt the familiar characters and locations of Starcraft to a third-person, three-dimensional, action-adventure setting. Blizzard has never done anything like that before, yet all of its releases are objectively very good. For the past decade it was though that Starcraft: Ghost had been aborted and that we'd never hear anything more of the game outside of random gaming trivia and wistful nostalgia. Yet Burger claims that this is not the case. That the game is, in fact, still in some level of development (albeit the depressingly stagnant purgatory level). So what does this news mean to you, the average Escapist reader? Not much. You may get excited for a few moments, but even if Starcraft: Ghost does eventually emerge from its unending development hell, that won't be for at least a few more years. Plus, there had to have been a good reason for Blizzard throwing a sheet over the project in the first place, right? 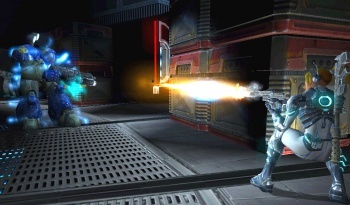 Contemporary reports indicated that the game just wasn't reaching the company's high quality standards. What could have changed that would suddenly alter that perception? Above and beyond all of this though, the supposed miraculous resurrection of Starcraft: Ghost is based entirely on the words of Matthew Burger. Nine of them, to be exact. It's not as if he detailed how Starcraft: Ghost would look on the PlayStation 4. It's entirely possible that Burger was simply reiterating a fact that most people have forgotten about Starcraft: Ghost: Blizzard never canceled the game, at least not publicly. We all just sorta assumed they did after the company stopped mentioning it. If Burger's statements amount to nothing, that's collectively on us.